Do you ever have trouble with ancient or medieval history because you can’t match a face to a famous name? Even when sculpted or painted portraits exist, they may be idealized (or demonized) versions of the person’s actual appearance. Cutting-edge science is helping to fill in some visual blanks. Facial reconstruction specialists use skills in anthropology, anatomy, art, and computerized imaging to truly put flesh on bones and re-create long-forgotten faces. Simon of Sudbury’s face is a new addition to history’s portrait gallery. Who, you say? Although not a familiar figure, Simon was Lord Chancellor and Archbishop of Canterbury in the decades after the Black Death ravaged England. He unwisely supported a tax that the common people hated. During the Peasants’ Revolt of 1381, Simon took refuge from an angry crowd in the Tower of London. But the mob stormed the Tower, grabbed Simon, dragged him out, and chopped off his head. His skull was kept in a church for centuries, so it was available to a graduate student at Scotland’s University of Dundee, who proceeded to reconstruct his face—gloomy expression and all. When facial reconstruction was first pioneered, all the work had to be done by hand, using plaster and clay. Today, computer programs do the heavy lifting. One computer program, called E-FIT for Electronic Facial Identification Technique, doesn’t use a skull at all. Instead, it helps produce composite images of wanted criminals based on eyewitnesses’ descriptions. Another University of Dundee forensic anthropologist has used a written prison record to create a face for a suspect in the worst unsolved murders in modern times—the Jack the Ripper killings. See his face at the BBC link listed below. 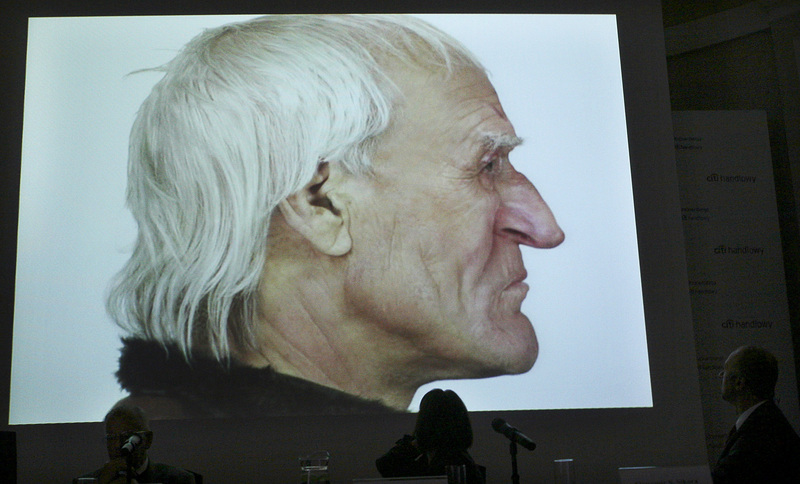 Learn more about Simon of Sudbury and how Adrienne Barker reconstructed his medieval face. View each step in the reconstruction, from skull assessment to the final layers. Read about the history and methods of facial reconstruction and see what Ivan the Terrible may have looked like. Is This the Face of Jack the Ripper? Was Carl Feigenbaum Jack the Ripper, and did he look like this? Find out why the German merchant is a likely suspect. Get a 3D view of what King Tut may have looked like. This site provides background information on the 1381 Peasants’ Revolt. He has a big nose! 🙂 but this is so cool the technology that we have now! ummmm do i want to see dead people????????? This is how I picture Ebenezer Scrooge. That is sooo cool and strange at the same time… I wonder what I would look like old… and dead! HUGE NOSE!!!!! geez who is Ebenezer Scrooge? Ebenezer Scrooge is JUST the main character in a famous story. This is very amazing!! But the guys nose is very creepin me out!! Hey, you used to write fantastic, but the last few posts have been kinda bonrig… I miss your super writings. Past few posts are just a little bit out of track! come on! In politics stupidity is not a handicap. by Napoleon Bonaparte. I feel that their idea for making thosee faces reappear as what they really are was a very constructive idea and more people should think of that instead of showing us lies. Duuudddeee! Noo wayyyy!! That is so totally rad broski!! !